In order to investigate how far the biosphere spreads out, some scientists have been working on bioaerosol sampling. However, only limited previous studies worked on pollen sampling at a high altitude. 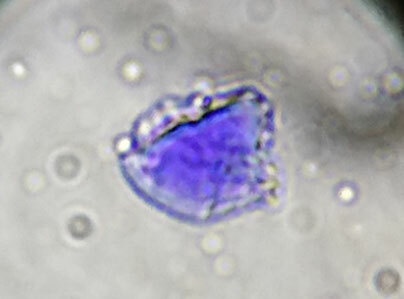 In this experiment, we worked on pollen sampling and visual observation of the sampled pollen grain to figure out the characteristics of pollen grains distributed above the timberline. The pollen sampling was performed over 20 hours from September 6th 11 a.m. to 7th 7 a.m.. In this experiment, we successfully sampled a grain which is dyeable by pollen stain.